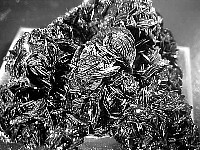 Hematite: Chub Lake, New York. This is a stunning miniature of shimmering, blades and blades of hematite. The photo does no justice to this brilliant piece at all. 2" x 2" . 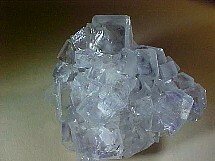 Dozens of cubes of water clear fluorite crystals with a hint of light purple, on minor matrix. Modified crystal faces on the topmost crystal. A pretty nice small cabinet piece. 2" tall x 2-1/2" across. 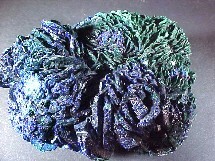 Lustrous, deep blue azurite after malachite. The photo does no justice at all to this wonderful small cabinet piece from the Day Copper Mine. 2-1/2" x 1-3/4". Rhodochrosite / Quartz: Silverton, Colorado. 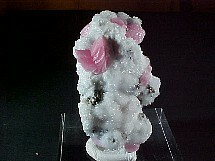 Pink rhodochrosite crystals on druzy quartz with minor pyrite. From the American Tunnel, San Juan County. A wonderful addition to your mineral case. 5cm (2") tall. 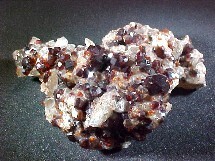 If you like garnets, then you'll love this specimen. Dozens of sparkling garnets on a quartz-like matrix. Under a light this small cabinet piece is magnificent. 3-1/2" (8-3/4cm) across. 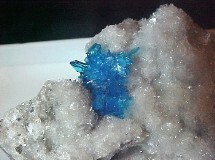 Blue pentagonite on a druzy matrix. The label states heulandite also. This is a very lovely miniature from the Wargholi Quarry. 1-1/2" x 1".